When a student is to be absent from school, please telephone the school by 9.15am Phone 5200602. Please send a note after an absence only if you have not telephoned. You can also notify the school with the Report Absence Button on the homepage of the website. Children arriving late to school must be accompanied by an adult to their classroom and the office notified. Children leaving during school hours require a note to the class teacher, and must be fetched from the classroom. As we have a “safe to school” policy any unexplained absences will be contacted by phone if time permits. Children gain much enjoyment from playing on these structures. Slides, platforms and climbing stairs help children gain confidence. Impact material has been placed under our adventure playground apparatus for the children’s safety. Teachers are on duty to ensure children use these structures appropriately. The Magnificent Kids Before and After School Care programme operates from our school hall Monday to Friday each week. Magnificent Kids also run Holiday Programmes Monday to Friday every school holidays. These are fun but often messy activities. A painting shirt/overall is advisable. Class presentation assemblies alternate with Principal’s Assemblies every Friday morning. Your class teacher will let you know the date(s) of their class presentation assembly. If you wish to attend this, please be seated by 9.00am in the hall. We expect an acceptable standard of behaviour and courtesy from all pupils. In serious matters of behaviour we will establish direct communication with parents. Our behaviour policy is available on request. We do not permit children to ride bicycles to school. The school has a Carol Service at the Holy Trinity Cathedral in December for all students and their families. The carpark is for staff only as parking is limited. The driveway at 250 Victoria Ave is for staff, delivery vehicles and emergency access only. Children are to walk down the “Dragon Drive” when coming to and from school via Victoria Ave. We suggest that children are dropped off for school on the school side of the road, and that they walk down the footpaths provided. Driveways must be kept clear of traffic. Year 3 – 6 children should be picked up and dropped off at least 200 metres from the school. Champions is a 30 minute lesson held at lunchtime, which allows students to learn about positive Christian values and beliefs. The Christian Religious Education programme weaves together Bible stories with values set out in the New Zealand Curriculum. The Bible stories are used to illustrate and teach different values such as loving your neighbour, personal worth, courage, inclusion and forgiveness. All children are welcome to attend on a casual voluntary basis. is an agreement between the Board of Trustees and the Minister of Education. sets out the National Education and National Administration Guidelines. Click here to download the School Charter. It is also available to view along with Policies and Implementation Programmes. You are welcome to peruse these documents at any time. Please enquire at the office. Children in Year 5 and 6 are able to participate in the Festival and Christmas Choir while Year 3 and 4 have a Junior Choir. These are trained by our Music Specialist. Parents are encouraged to be involved in classroom programmes. We use this as a valuable experience for both parents and children. Training is given at the beginning of each term to clarify parent roles in the classroom and to provide guidelines. Each class has a parent representative who acts as a liaison between the teacher and parents by organising social get-togethers and parental help in and out of the classroom. A class directory of parents and phone numbers is available from your class parent. Victoria Avenue School is a primary contributing school for children aged five years to eleven years, Years 0-6. The Library is fully computerised and the school currently has a range of computers and devices used in classrooms. The school employs an ICT specialist to support the development of IT programmes across the school. We are fully networked. This usually takes place in Term Three. Parents are welcome to attend. During the year cultural groups visit the school to give performances to the children. These are restricted to approximately one per term. Only those groups and visits, which provide a sound learning experience are organised. 1.20 pm Hand bell, prepare for afternoon. Children are required to be at school no later than 8.45 am, as this is the time they enter the classroom. At 8.50 am the school day begins for instructional work. This early start to the day is important for setting the scene for the morning. It is therefore important that parents help facilitate this by having the children at school on time. If you wish to speak with teachers before school, please remember they have a responsibility to the class, particularly from 8.45 am onwards. The best time to talk at any length is to make an appointment for a time after school. Children are supervised between the hours of 8.30 am and 3.15 pm. Our dental clinic is no longer in use. Our dental team is now based at 8b Ngaio St Orakei Ph5200603. A fully equipped dental van will visit the school at various times during the year. The dental team will be posting letters to all new entrants to our school as required. There are also a number of Hub clinics available for parents to contact if necessary. Our closest Hub clinic is Orakei Children’s Community Dental Clinic at Orakei School or Remuera Intermediate – if you are unsure where to go phone 0800 825583. Discos organised by the PTS are held each year. All children from Year 1 to Year 6 are welcome. Parental supervision is required and a roster is organised by the PTS. Children must be delivered and collected from the hall by an adult. Largely for health reasons, the school has a “No Dogs” policy on school property, unless of course the school has a “Pet Day”. Please support the school on this matter. Parents should complete an pre-enrolment form when their children are 4 years old. Application for Enrolment forms are available from the office or from our website. For an Inzone enrolment form CLICK HERE or, if you are living out of our school zone, CLICK HERE for the application form to be included in the ballot. Please download the appropriate form, complete and post or fax to the school. This is a cruciaI lifeline. Please keep the school up to date with home or work place phone numbers and also an alternative such as a grandparent, close friend or relative. Please click on the email address and forward us of any changes of your contact details promptly. Email the office [email protected]. Thank you. The provision of adequate funds to ensure consistent high quality educational opportunities for our children is one of the more important functions of the Board of Trustees and PTS. Part of the necessary funds is provided by grants from the Government, but there is a considerable level of spending required for equipment and resource material over and above such grants. The PTS is active in fund raising activities and seek the support of all parents in this very important aspect of school administration. We take pride in our school grounds and buildings. We are fortunate to have an attractive school setting, and we attempt to make the school a pleasant and welcoming place for the community to enjoy. We believe the school can serve our community in many ways and with sensible use of the grounds and recreational facilities we can continue to foster a sense of community in our district. We ask all residents to assist us by taking pride in our school along with helping us to see that our grounds are cared for outside school hours. If parents observe vandals or vandalism at school, please contact the local Police, or telephone Matrix Security Ph 529-0605. A monitored security system is operated in the school. Parents and neighbours are not permitted to walk dogs in our grounds. The hall is available for hire to approved local groups and families. Bookings are to be made through the school office. Please email your request. The Public Health Nurse may be contacted on Ph. 357 2260. This service is available to all parents who have concerns about any aspect of their child’s health. The Public Health Nurse is available to examine any child on parent or teacher request and follow up any matter of concern by contacting the parent. Twice yearly, the Vision and Hearing Team visit the school to test all new entrants and any referrals from prior visits. Magnificent Kids (our before and after school care provider) also run Holiday Programmes Monday to Friday every school holidays. Children will have home learning. Junior children will bring home books, poems and activities, and parents are encouraged to hear children read and take a keen interest in listening and positively responding to school activities. Classes from Year 3 to Year 6 are expected to read regularly and to undertake homework activities as set for the week. Work undertaken at home should be an extension of work undertaken at school and should consolidate earlier learning and teaching. Accidents and illnesses are attended by the teacher or trained first-aider in the sick bay (near the office) and are recorded in a log. Standard treatment procedures as recommended by the Department of Health will be applied. First aid is given for simple cuts or abrasions. Where a more severe injury has been sustained, parents will be immediately notified by phone and will be asked to take the child to a doctor. The wearing of all jewellery at school is discouraged. However watches may be worn by your child. The school cannot be responsible for the loss of jewellery. Each class is timetabled for Library and the ICT suite is used for our GATE students during the school week when our specialist teachers teach the pupils. We welcome parent help in the library for processing new books and repairing old ones. We have a computerised issuing system. School librarians are elected every year and assist in the smooth running of our library. Computerising the library enables us to supply information on how often a book is borrowed, as well as the titles of books that your child is reading. Please ensure that our library books are treated as friends and reinforce the good habits taught in our library lessons. Pupils may use the library during the lunch hour. There is a lost property basket where mislaid property is available to the owners. This basket is situated outside through the doorway opposite Room 3. You can help by making sure your child’s belongings are clearly named. It is sorted regularly and named items are returned to their owners and unnamed ones are taken to the charity bin at the top of the teachers’ driveway. There is a strict NO FOOD SHARING policy in place at school. Most of us will be aware of at least one child who suffers from food intolerances and allergies. For these children the consequences of contact with the wrong food item can be, in the worst case, life threatening. We have a number of children at school who are at risk of severe allergic reactions, anaphylaxis. Each of these will have appropriate medication onsite, usually in the form of an epipen, but it is our goal to never be in a position of having to use one. If you are organising parties or an end of year class get-together please be aware of the potential dangers of food sharing in this environment and make every effort to keep those vulnerable children safe. Education is the key to ensuring the safety of our children. Teachers have discussed these issues with their classes and we ask that you talk about this with your child too. There are a large number of foodstuffs that individual children are allergic to including common items such as nuts, dairy products and eggs. With over 550 lunchboxes in school every day it is impossible to ensure that any such items do not find themselves into school but by ensuring the children don’t food share we can dramatically reduce any risk to individuals. Children are not permitted to go to local shops to buy lunches. Please check that your child has enough, or alternatively not too much lunch or morning tea. Children are not to bring sweets or fizzy drinks to school. A lunch service is offered every day. Children place orders at the front office before school. Menus are provided on our website. Click here for menus and instructions. In the interests of safety children are discouraged from bringing glass bottles to school. Plastic drink bottles are safer. Canned drinks are also discouraged. We request that parents securely tighten drink bottles before they are placed in school bags. Children with special requirements must lodge their medicines with the School Secretary at the office and complete the appropriate form. Click here to download form. Office staff are responsible for administering medication. To assist office staff please send any money to school in an envelope and clearly marked with your child’s name, room number, the amount and what it is for. The bringing of large sums of money to school is not encouraged. A pre-school morning is held for New Entrant children and their parents shortly before their intake into the Junior Department. Morning tea is provided. Please click here for more information regarding new entrants and enrolment. Newsletters form an important communication link in keeping you informed as to school wide events, class trips, upcoming events and curriculum developments. Each Thursday the school issues a newsletter – on our website. Archived newsletters will also be available on the school website. The Board of Trustees publishes an additional newsletter after each of its meetings throughout the year. Click here to view the latest board newsletter. Newsletters in paper form are available from the front desk at the school office. Each year a production is presented to parents and friends. It may be a play, musical or based around an Arts theme. We offer KBB Music lessons at Victoria Avenue School. Students who take part in these lessons are eligible to play in the orchestra. The orchestra is tutored by the KBB music teachers. 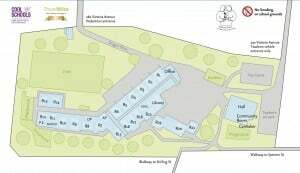 Some areas of the school are out of bounds including the Teacher’s car park and driveway and the driveway beyond the Dental Clinic. All children participate in regular physical education lessons with both the PE specialist and the class teacher. Emphasis is placed on fitness and the mastery of skills. The school follows the Kiwi Sports programme and offers a wide range of activities for the children. Children participate in a wide range of sports including athletics, basketball, swimming, netball, cricket, softball, soccer and rugby. All children are expected to take part in these activities. Middle and senior students are to wear our sports uniform for physical education and sport. A hat for use in summer is essential. The sports uniform is available at the Uniform Shop. Providing materials for school use. Talking with groups of children about interests. Offering a special skill such as arts and crafts, coaching a sport, playing the piano. Library assistance, e.g. repairing books. Listening to children reading and providing special individual assistance under the teacher’s guidance. Helping with supervision and providing transport on school outings. Serving as a Trustee or PTS member. Please contact the office if you can help, or in the case of help in the classroom, contact your class teacher. All parents are welcome at the school to discuss problems that may arise. Please telephone the office for an appointment or send a note to the class teacher. Our complaint’s policy is available by request and on our website. That we read from left to right, return to the left continuing in this fashion. We encourage the movement of hand or finger under the line to reinforce this behaviour. That we have words and the marks in these words are called letters. How to point to each word while reading. Ask your child if there is anything they can tell you about a page. A word or letter or even a sentence could be given. If your child offers nothing, accept the first reading and please note it is not necessary to know all words individually. Do not hesitate to tell them words they do not know. Enjoy this time and notice the things they can do. Gradually school will help them learn the things they can’t do now. Give encouragement and show you are happy. This will give confidence to your child and help him/her to keep at the job of reading. Please contact the office if you can help, or in the case of help in the classroom, contact your class teacher. Victoria Avenue is a very busy and potentially dangerous road. When collecting children from school please ensure you park legally – NOT across driveways or yellow lines. Double parking is dangerous for all. Traffic Police regularly monitor the area so please act responsibly. Please do not drive into entrance ways in order to turn around, children are small and not easily seen and such action can frighten young children. There is also access to the school from Spencer Street and Stirling Street. do crossing duty on Victoria Avenue after school. If you can help, please contact the office. We have endeavoured to keep our rules to a minimum and all are based on common sense and thoughtfulness for others. In fact if you sum it up “Doing the right thing, in the right place, at the right time” just about covers it! Pupils who damage school equipment through carelessness or by breaking school rules will be responsible for replacement of that equipment. We encourage children to be helpful and tolerant of others. Any aggressive or unreasonable behaviour is not acceptable at the school. The ultimate level of discipline is to have pupils acting independently, achieving self-discipline. This is derived from doing the “common-sense thing” and accepting responsibility for their actions. Camp is an important aspect of our Education Outside the Classroom Programme which provides valuable opportunities for students to experience and learn about the outdoors. Camps are planned every year for all students in Years Four, Five and Six. Click here to view school camp information. We have 12 council members elected every year. These 12 pupils are given responsibility and support the Senior Syndicate Leader and staff. All Year 6 pupils have a position of responsibility which gives them an opportunity to support their peers and the running of the school. These are all important leadership roles within our school. A stationery pack is purchased at the beginning of each school year. Any extra stationery may be purchased from the school. The shop’s opening hours are advertised in the school newsletter. Click here for price list. All pupils are required to wear a sun hat during outside play in the summer months. This is strictly enforced – no hat, no play. Each class has a pump bottle of sun-screen that is available to all pupils at all times. Protection is a priority for our pupils. Lunch eating is supervised in a shaded area. The bringing of sweets or chewing gum to school is not permitted. The bringing of toys to school is discouraged. All children are encouraged to wear the correct school uniform. The wearing of school uniforms helps to give children a pride in their school and helps to promote a sense of equity amongst pupils. It is recommended that children have slippers or socks for indoor wear during the winter. Children may leave their slippers at school. Young children should wear shoes that they are able to manage themselves. All uniforms must be clearly named. Most orders through the Uniform Shop are now made online via our website. Order forms may be collected from the school office. Orders lodged with the office by Tuesday each week are available for collection on Thursday. The shop’s opening hours are advertised in the school newsletter. Written permission of parents is required for children leaving the grounds. Parent transport is essential on most outside visits, and is greatly appreciated. All children are required to wear an approved safety restraint when travelling by car on such visits. A volunteer support form is sent out to all families by the PTS at the beginning of the year. This register provides a network of parents willing to assist with various activities throughout the year. The more volunteers we have the more easily we can spread the load. If a specific request is inconvenient at the time, you can always say no. Please contact the PTS for further information. Children should bring appropriate clothing or footwear for the winter weather. (See also uniforms). The school supports a wide range of worthy causes. Our Year 6 Councillors play a significant role in chosing which charities to support each year. Each term the children participate in a fundraising activity. BOT – Board of Trustees. An elected group of parents, the Principal and a staff representative, who are responsible for the governance of the School for a three year term of office. PTS – Parent Teachers Subcommittee. A group of parents and staff members who work together on various school events, from curriculum dissemination to information evenings and fundraising for the benefit of all pupils. ERO – Education Review Office. The official Government agency charged with the auditing of schools. A classroom assistant who supports the teacher in small group teaching of special needs pupils and a variety of other activities. A group of classes who work together planning programmes of work, trips, activities and interchanges. ICT – Information Communication Technology. Learning skills for the use of computers, internet, faxes and accessing information. The term ‘curriculum’ has several meanings, depending on the context in which it is used at school. Curriculum – What is taught in each subject. Curriculum Statement – National guidelines that provide the basis for programmes in schools from Year 1 to Year 13. The School Curriculum – The way in which a school puts into practice the policy set out in the national curriculum statement. It takes into account local needs, priorities, resources, and is designed in consultation with the school’s community. The New Zealand Curriculum – A set of national curriculum statements which define the learning principles and achievement aims and objectives which all New Zealand schools are required to follow. Broad-Based Curriculum – An extension of the curriculum to include a wider variety of learning opportunities such as camps, technology- and sports. Individualised Learning Programmes developed to meet individual needs. Developmental Learning – Learning by doing.